If a picture says a thousand words, then a good family portrait wall says a million! When it comes to displaying family photos in your home, the thought of pulling it all together can be somewhat overwhelming. 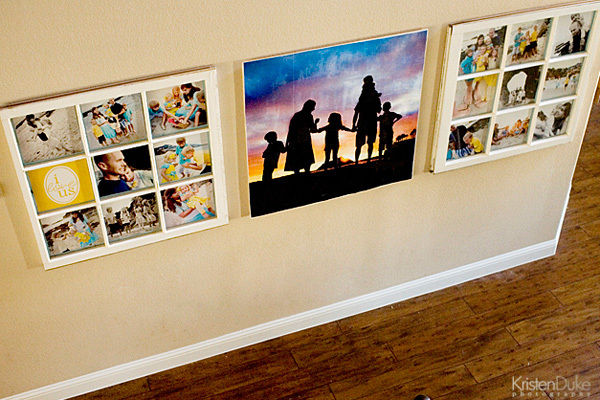 SheKnows asked two professionals to share their tips for creating an impressive portrait display the whole family will love! Where does my family spend the most time in my home? What areas will guests see when they are in my home? What rooms do family members pass through most in my home? Filling a vintage window pane with prints? If your budget allows, hire a professional photographer to shoot your family portraits. Professionals can help you with styling your shoot to accommodate the look you want to create. Before your shoot, know what types and sizes of photos you would like to display so your photographer can capture the necessary shots. To get the best results from do-it-yourself photography, Kristen recommends asking a friend to assist with the shoot, and learning more about the settings on your camera. Her book, Say NO to Auto, teaches beginning photographers how to use camera settings to take their photography skills to the next level. You can pick up Kristen’s photography guide for $10 on her website. For her home, Shelley uses custom vinyl to create inspirational thoughts, quotes, and artwork that is sentimental to her family. This print from House of Smith Designs, priced at $15, is one of the many designs you could use in your home to create a custom look your family will love!